Humans have been eating flesh of bovines from prehistoric times. They domesticated cattle around 8000 BC to provide ready access to milk and leather. It is unknown when people started cooking beef and veal but as times passed there was a huge demand for it. Veal is a meat that we get from the flesh of a calf, usually younger than 20 weeks old. These calves are separated from the cow 3 days after their birth. They have nutritionally balanced diets that contain iron and 40 other nutrients which are essential for them to grow. We could say that most part of the calves are special fed. The calves are treated individually with specialized care. They have a milk replacer diet which provides them with 40 vitamins and minerals that they require. The calves that are slaughtered and used in the veal production are a by-product of dairy industry. Beef on the other hand, beef (also called "red" meat) is the flesh of a cow, steer or bull which are raised and killed for their meat. They are usually 2 years old. Beef is known as "red" meat because of the red cells in the blood which is delivered by the oxygen to the muscles; also it contains more myoglobin than fish or chicken. We know at least 50 different breeds of beef cattle but only 10 of them are mostly produced because of their demand in the market. There is no special treatment for these cows at the beginning. All the cattle start to grow by eating grass and when they are mature enough they are fed specially formulated diet which is mostly based on corn and other grains. However, hormones are also used to promote their growth. Antibiotics may also be used to prevent them from getting infected or treating a disease. Beef is aged from 10 days to 6 weeks to develop additional tenderness and flavour. Some of the biggest cattle breeds are Angus, Charolais, Brahman and Hereford. Veal has been an important ingredient in Italian, German, Swiss, French, Hungarian and Czech cuisines. It is usually prepared in dry or moist heat. It can be roasted, broiled, grilled or stir fried to make cutlets, veal patties, loin chops and barbecues. Brazil, India and Australia are the world’s largest exporters of beef. Countries like Uruguay, Canada, Paraguay, Mexico, Belarus and Argentina also give a large importance to beef products. Beef is also grilled on charcoal in countries such as New Zealand, US, Uk, and Germany. This is known as barbeque or charbroiling. Some dishes made by beef are Mechado (Philippines) Meatloaf, beefsteak, khash, meatball and so on. When looking down the charts of comparison, it becomes visible that according to their market value beef is cheaper. 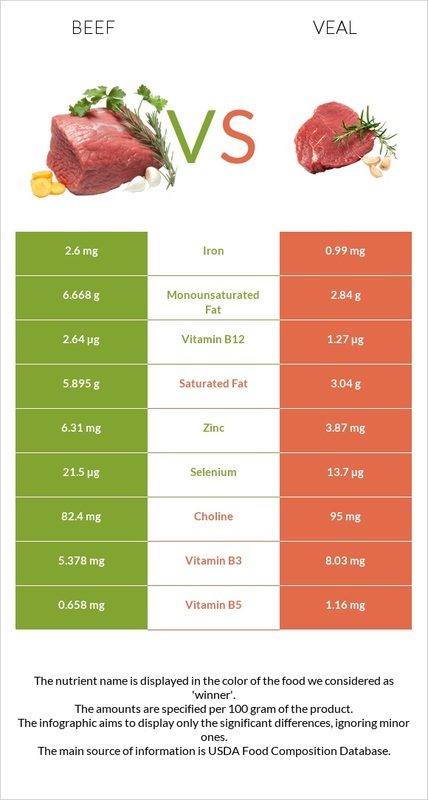 From the viewpoint of minerals, these foods are almost equal, whereas beef contains three times more iron and two times more zinc compared to the first food. The calculations are based on 300gr of each meat type. From the other hand, veal contains more potassium, magnesium, copper, phosphorus than the other one. When talking about vitamins it should be mentioned that veal is relatively high in vitamins, as it contains approximately two times more vitamin B3 and B5 than the other one. However the latter contains two times more vitamin B12 than the other one and they both contain almost equal amounts of vitamin B6 and K.
Veal is rich in Vitamin B which gives us energy and a healthy metabolism. There are people who have difficulty in digesting beef or any other red meat but veal is easily absorbed by your digestive system because it is tender. Eating veal is good special for those people who have low carb diet because veal has zero carb. People who avoid eating high calorie or high cholesterol food can safely eat veal. Beef is affordable, healthy and environmentally friendly food. It contains nutrients such as protein, iron and zinc. Beef has the same heart healthy fats that we find in olive oil. Beef is nutritionally denser than peanut butter, beans and other vegetarian protein options. It is important to highlight that grass-fed beef contains almost two times more beta-carotene and lutein than conventionally fed beef. And you may check the type of meat by the colour o fat, if it is yellowish, then it is grass-fed beef. Moreover, grass-fed beef contains less cholesterol than conventionally fed calf. Various large-scale studies show that the chronic immune and inflammatory health issues are radically decreased due to the intake of grass-fed beef. And all it is thanks to substantial amounts of the antioxidant vitamin E and beta-carotene, selenium and zinc in the consistency of beef. Conjugated linoleic acid (CLA) is an omega-6 fatty acid present in grass-fed beef. Its unique structure promotes various health benefits such as inflammatory and immune support, improved bone mass, blood sugar regulation, maintenance of lean body mass and reduced body fat. As a conclusion, it stays to add, beef is richer in vitamins almost two times, whereas in the area of minerals they are almost the same. What refers to calories, fats and proteins, beef is a winner again. Thus, it is up to you which one to choose as different people have different requirements and preferences.